All things relating to aquaponics and my system. Growing up on a dairy farm meant that we always had fresh milk, and Grandma used to have a wonderful vegetable garden using aged cow manure as a fertilizer and soil conditioner. Fast forward nearly 50 years, and I now live a long way from the dairy farm, in a fairly arid area. When we moved onto the bush block, I tried gardening using traditional methods. Sure, I managed to grow some herbs, and salads, but that was all. The tree roots would rob the plants of moisture, and so after a couple of years changed. I made a tunnel using reinforcing mesh and 50% shade cloth. The garden beds were lined with builders plastic and filled with aged cow manure and soil. 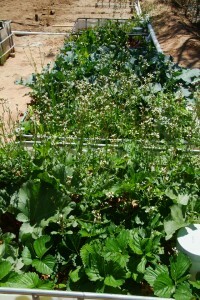 It worked very well, producing good quantities of vegetables and herbs year round. I even managed to have tomatoes and bell peppers survive over winter with our heavy frosts. It took about 3 years and the tree roots penetrated the plastic garden bed liners, and production dropped dramatically as the trees stole the moisture. While living and working in Alice Springs, we stayed with friends who had created an aquaponics system using recycled bath tubs and spas, with 200 silver perch. It worked very well, and provided a lot of herbs and vegetables for everyone staying there. I have tried hydroponics before. It worked well, but I had to keep buying the minerals and fertilizer mix, as well as dumping the water every so often. I considered the dumping of the water a huge waste, especially here, were we get 600mm annual rainfall and 2.5m of evaporation. I’ve tried aquaculture, but because I never had a large, continually flowing source of water, could never stock the fish densely enough to make it worthwhile. Also, the water had to be dumped occasionally. 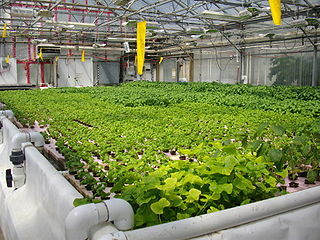 With aquaponics – a combination of aquaculture and hydroponics, the media in the growing beds act as a biological filter for the fish. To me, it is the best of both worlds, and I get fresh fish as well as vegetables.. 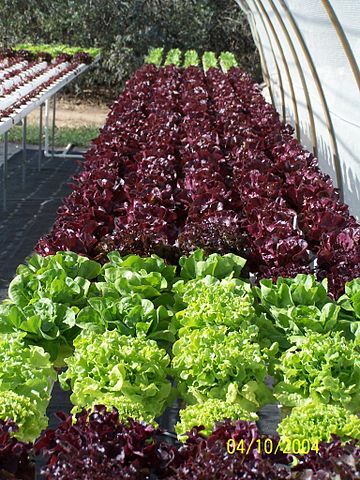 According to research, it takes only 10% of the water to grow the same amount of vegetables as would grow in soil. There are many different ways to set up an aquaponics system, ranging from small fish tank size with one or two small growbeds suitable for the balcony or the edge of the patio, to full grown commercial systems producing tonnes of fish and vegetables. A cheap way of getting started, that works well is to use IBCs – International Bulk Containers – of 1000l capacity. As long as the ones used have not contained chemicals, they can be cleaned and used. For more information about many different ways of using these containers, visit and download the free IBC of Aquaponics publication from http://www.backyardaquaponics.com/Travis/IBCofAquaponics1.pdf. There are also many YouTube videos available to view to see how the systems work. After about 6 months of research and design, I started getting mine established. I was given 6 IBCs, and I had a couple that I used to use for water carting. My system is referred to as a CHOP2 system – that is the sump tank pump is below the growbeds, and pumps about 80% of the water through the grow beds, and about 20% through the fish tank. The fish produce ammonia, which the bacteria in the grow bed media convert to nitrites and eventually to nitrates which the plants can use. Oxfam has stated that for the sixth time in the last 11 years, the world is going to consume more food than it produces. 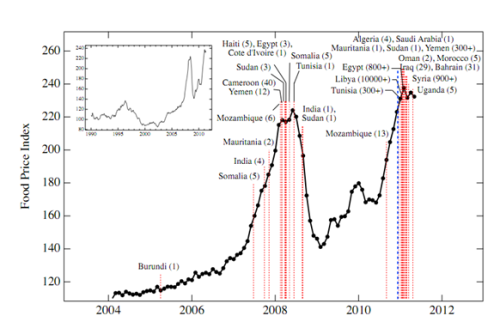 This is caused by unusual weather conditions in the USA, Russia, and other major food exporting countries. It is estimated that staple food prices will double in the next 20 years, which will be disasterous for poor people around the world. So, you wonder, what does this have to do with you? For starters, more of your income is going to go to paying for the food you and your family need to survive. More people are going to be hungry, and get more diseases, and more people will die because of malnutrition (especially children, who are most susceptible). What can you do? Well, you can do a number of things. You could start a small garden at your home on your balconey or in your yard or on the road verge. You could join or start a community garden program. You could shop at your local farmers market, which in turn encourages them to grow more food and sell locally. You could contact a local farmer and buy direct from them or even form a cooperative with others to do the same. If you have the room, you could start your own aquaponics project. From the space of a single car carport, you should be able to produce enough food to feed 4 people. I started off my aquaponics with Seasol fertilizer. I currently don’t have any fish in the system, as I have not been able to source any (the hatcheries are all sold out). I’ve been running on a pure source of ammonia, checking levels daily. Some of the newly emerging leaves have yellow edges. Normally the waste from the fish provides the ammonia and other nutrients required. Sometimes potassium and iron can be lacking, which can result in leaf yellowing. Some web sites suggest adding a few rusty nails along with seaweed extract. I have added the seaweed extract, as well as some iron chelate mixture. This has solved the problem.